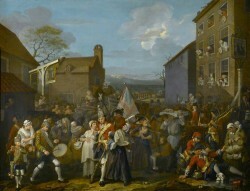 From Bosworth Field to Finchley Common: Britain, Hogarth and the 1745 Jacobite Rebellion. On a summer’s day in 1745, William Hogarth stands in the painting room of his house in Leicester Square. Before him is a large, half-finished canvas of a military encampment the night before a great battle. In the top left corner, the first light of dawn rises above the assembled tents and glances off the gathering storm clouds. Beneath this, foot soldiers warm themselves by a small fire. Dominating the entire foreground is a solitary figure who has been roused suddenly from a terrible dream. Suspended between one action and the next, his tense body turns outward, right hand raised with fingers splayed, his wide eyes betraying confusion and fear. His left hand grasps the hilt of the sword lying at his side: a gesture that draws the eye towards the object located just above this hand. The object concerned, the contested crown of England, lies at the heart of this drama. The figure is King Richard III of the Royal House of York, the rightful king or usurper, as your loyalties dictate. In a few hours from now he must face his cousin, Henry Tudor of the Royal House of Lancaster–in turn the rightful king or pretender–on Bosworth Field. The subject is civil war, dynastic loyalty, legitimacy and usurpation: the nation is once more divided and the future of a Kingdom hangs in the balance. Hogarth’s painting is in fact a portrait of his friend David Garrick in the eponymous Shakespearean role that four years earlier had made him the darling of the London stage. But as fate would have it, while Hogarth gently applied paint to canvas and life went on about him in the streets of London, a mere six hundred miles north another would-be king, Charles Edward Stuart, had already landed with a small cohort of supporters on the Outer Hebridean Island of Eriskay. This was the modest and uncertain beginnings of what was to become the ’45 Jacobite Rebellion: the most recent attempt to remove the House of Hanover and restore the House of Stuart and arguably the single most important domestic challenge that either George I or II ever faced.